Imagine this! You start a business that caters to people’s interest in haunted houses and Halloween. Your online content is engaging and your operations are thriving. All due, in part, to your social media savvy and hard work. You’ve dedicated years to building relationships with your customers. You’re on Facebook and have grown a respectable following on the platform. It seems like magic every time you post. Engagement and traffic to your page is through the roof. You’re doing social media right! Congratulations. Fast forward a few years and you now have, what you consider, a massive following. Why is my social media marketing not working? But something doesn’t seem right. When you post you notice that your engagement is declining each month. The reach is going down as well. Why aren’t your followers seeing your content or engaging with it? You explore post frequency, viral content, product giveaways, all with little success. Then the notification pops up “Reach your 600K followers for only $100”. Even for the people that have subscribed to your content. Pay to Play is Nothing New to Advertisers. This is no different. You have to up your organic game AND your paid advertising game. That’s the new normal. It could be worse, though. 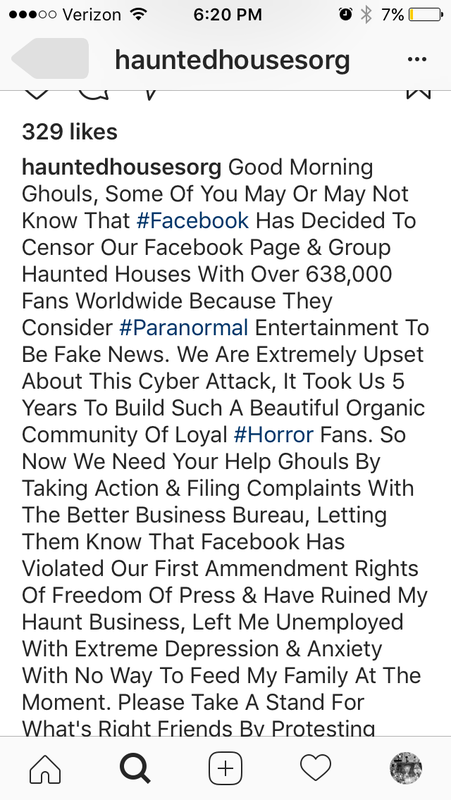 In real life, there is a haunted house facebook page with over 600K subscribers. Or should I say there “was” a page? Here is where the trouble comes in. If you’re investing in social without an external endgame, you are NOT in control. I’ll get to the external end game in a moment. First, the inspiration for this Op-ed. It came as I was scrolling through my personal Instagram account. by THEIR own lack of planning. and the problem with not having an external end game. They invested 5 years of time, grew to over 600K subscribers – and in one day that was all reduced to ZERO. They have nothing to show for what they’ve done. Had they come into social media with an ownership mindset this would not have been as severe. Likely, Facebook’s decision would not have harmed them in such a drastic way. Since Facebook decided their niche was “Fake News”, they’re now OFF the platform. In reality, this page is paying for Facebook’s fake news fiasco. Having to incur the wrath of their “too late” damage control. At the end of the day, none of that matters. What matters is what you CHOOSE to give up when you focus on a “Social First” strategy with no external end game. You give up control over the future of your business and hand it to a “Too Big To Care” platform. Your 600K followers seem like a lot to you. it is a pebble of sand in a vast ocean. The External Endgame: Making Your Following Your OWN. The goal for EVERY business should be to grow its own internal contact list and customer database. Using Facebook as your end all be all is a recipe for disaster like we’ve seen above. So how could this Haunted House group have mitigated their disaster? By creating a strong “off social presence”. As in a business website that focuses on collecting emails! This is a key first (or very early) step every business needs to take. Start hoarding those emails now and forever. Engage with your audience by giving them what they want. It is up to you and your customers if they read or see your content, or even whether they continue to subscribe. It will be a decision (on a more intimate level) between your customers and you. The only real middleman is the SPAM filter. The rest is on you. b)not be in the position they are in now, having to choose between starting over or closing shop. What a blow for an entrepreneur! Going back to the issue of reach. This is a very real problem. It doesn’t matter if you have 1,000 followers or 500,000. Facebook is reducing the reach of Page posts. How much have they reduced it? That is hard to say. 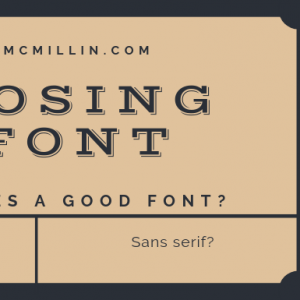 I did recently come across this medium post. 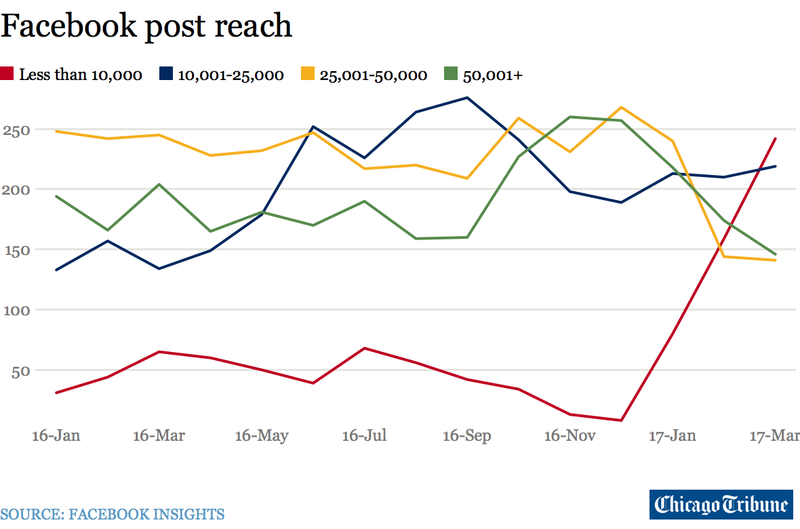 Detailing the Chicago Tribune’s problems with Facebook reach. The rise in posts that are getting less than 10,000 reach shows this is a real issue for businesses. The current organic, workaround for this is creating groups with a strong following. Group posts, reach their audience at much higher percentages than public posts. To avoid or reduce the impact this has on your business follow these 3 strategies. You can start implementing them now. Collect emails. 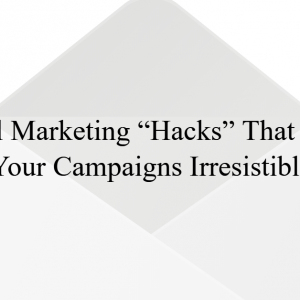 Whether on your site, facebook lead ads, or through a hosted landing page. Start collecting and growing your list. “Get good” at email marketing. The ROI has been the best, on a general level, for over a decade. No sign of changing there. Post Less – Let those posts ride. Don’t cannibalize your reach by over posting. Why should you continue using Facebook? Social Media Marketing? 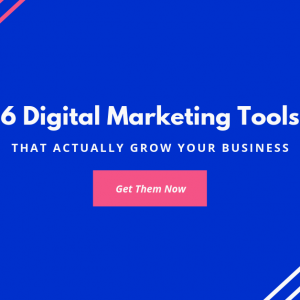 It allows you to find and connect with people in your niche and industry. It is an amazing tool, the likes of which, advertisers have never had at their fingertips until now. I want to sell a house, Facebook target people that have the behavior “likely to move” and live in these geographic areas. Find people that will shop at my hardware store. In Ad Manager, I target people that live in your business area. Have an interest in small/local business, enjoy DIY projects and watch a lot of HGTV. It is an amazing tool! The keyword here is “tool”. Use it that way and you’ll be in a good position. Use it as a business and you’re giving away your control to a platform. It is something we should be giving thought to for your next major marketing strategy. Groups are another great opportunity for building a strong community and brand presence. I’ve been a part of several, including lifetime tech deals, that gained 1,000’s of organic followers daily. The end game must be kept in mind. Who controls the content and delivery. The answer, if you’re a business owner, should be you. Do that through list and community building.